Maybe one of the more irritating responses from people covering the sequence of events has been lor them to trot out that tired old quotation from Churchill about the steeples of Fermanagh and Tyrone. None of that is true. Those kinds of comments simply exhibit an inability to distinguish the sausage from the sizzle. Unionists have been doing their inevitable sizzling, talking of a ‘graduated response’ which, if you want to know, means they’re making it up as they go along. They haven’t a clue what to do next but what you can be sure of is that within a fortnight they will disagree completely among themselves a bout whatto do. Besides, they’ll all clear off on their holidays after Sunday leaving the yahoos they brought onto the streets taking turns to sit in their squalid encampment at Twaddell with others making the occasional nostalgic symbolic visit to their last failure at Drumcree. So much for the sizzle. The substance is one simple truth which escapes unionist leaders: if you live in the past you can’t learn from the past. It’s futile to behave as if you own Norn Irn and can make up rules to suit yourself. The notion that if you don’t like the rules you can take the ball, stop the game and go home doesn’t apply any more. The 1985 Anglo-Irish Agreement put the kibosh on that unionist tactic. Unionists walked out of Westminster, boycotted British ministers, refused to operate local councils, and what? They may try some of the same stuff in the next ten months in the run-up to the Westminsterelection in May 2015 but the lesson of the last 30 years is quite straightforward: they’ll be back. There’s another lesson. Every time unionists walk away from the table there’s less on it when they return; an inevitable result of their stupid tactics. Consider the present idiocy. By walking out of talks which were their only chance of replacing the Parades Commission they detest, unionists have now guaranteed the role and status of the very same Parades Commission. Brilliant eh? On top of that, the previous attempt to find a replacement in 2010 looked as if the Office of First and Deputy First Minister might be given responsibility for parades. That’s now a non-starter since OFMDFM can’t agree what day it is, let alone attempt to adjudicate on parades. So, thanks to unionists’ genius negotiating there will be Parades Commission determinations next year they can protest about with equal futility. It is true, as Martin McGuinness says, that unionists are ‘dancing to the tune of the Orange Order’. None more so than the DUP, most of whose senior members are in the order including Nigel Dodds, Nelson McCausland, Gregory Campbell and Jeffrey Oonaldson. Indeed the DUP sent the order’s chief medicine man Mervyn Gibson to represent them at the abortive talks which raises an obvious question. 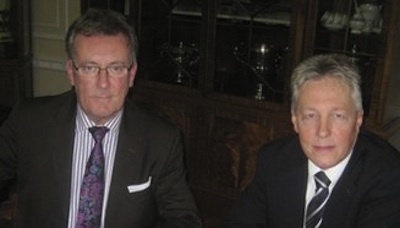 Who are Sinn Fein negotiating with, the DUP or the Orange Order? It’s all academic of course because, while it simply reinforces the contention that the Orange order pulls the strings in the DUP it makes no difference to where real power lies. That location was made clear in the short press release announcing that the Taoiseech and David Cameron had spoken for fifteen minutes about the rising tension produced by the Orange Order/DUP. Both premiers reiterated their support for all the institutions of the Good Friday Agreement. In other words, even if unionists decide to boycott those institutions for expediency or short-term political manoeuvring, they can do nothing to shake the Anglo-Irish Intergovernmental Council which will continue to run this benighted place no matter what antics unionists get up to. Then after this huff is over unionists will have to return to the negotiating table as they have had to do on every previous occasion when they walked away. Remember the DUP walked out of talks in 1997 but returned in 2005 to accept what they had rejected in 1998. They know there’s no alternative except more Dublin involvement.